Onion Pakoda is a very popular snack recipe which can be prepared in just 5-10 minutes. In Mumbai, it is known as "Kanda Bhaji". It is also a popular tea time snack and tastes great with green chutney or ketchup or as it is. 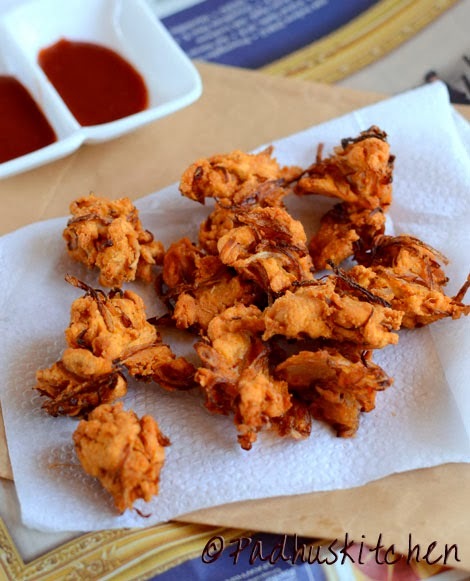 This very simple and easy onion pakoda recipe is from a friend. Today we will learn how to prepare South Indian Onion Pakoda following this easy recipe. Cut onion thinly lengthwise and keep it aside. In a bowl, mix together onion, salt, gram flour, rice flour, chilli powder, 1 tsp hot oil and hing. Add approximately 4 tsp of water and mix well. After mixing, it will be as shown in the picture below. Heat oil in a kadai. To check if the oil is hot enough to fry the pakodas, drop a little batter into the oil, if the batter raises to the surface immediately, the oil is ready for frying the pakodas. Reduce the heat to medium, take a little prepared pakoda batter and drop it into the oil as shown in the picture below. Do not make balls or shape it, this pakoda should be shapeless. Fry until golden brown, stirring in between. Remove it from the oil and drain excess oil on a colander or paper towel. Serve onion pokoda with a hot cup of tea, coffee or South Indian Filter coffee. Note - Rice flour should be half the quantity of gram flour/besan. I am sure you will love my Spinach Pakora Recipe also and do not forget to check out my long list of Snack Recipes. All time favourite and very handy, when some one arrives in no time.. crispy looking pokadas..
Crispy pakodas with masala chai, my prefect tea time snacks. Just had it yesterday when it was raining!! Pakoras look super crispy and tempting! looks like this onion Pakora gonna taste awesome in this weekend..
My kids gonna love this pakora . Wow....nice. Hi padhu...pls post healthy foods for pregnant women. I tried this recipe and wow it was so tasty. My husband loved it . I have never tried making pakoras earlier. This is the first time and your recipe made my day :). Thanks for posting such good recipes. Thanks for the recipe. It rained last night and we were in the mood for chai pakoras. A quick look at Google directed me to your page. My first try and thanks to you the results were great. Esp the tip to have half quant of rice flour was useful for different portions of the mixture. Thanks again, good job, keep it up! How long it can be stored? I'm staying in hostel. So whenever i go home, i can make this snack and take it with me. Dear padhus .. I tried this yest.. it came out awesome. . Infact I dont own a grinder and there s no maavu mill here .. so I tried to grind kadalai paruppu in the miXie and tried it.. because of that I couldn't get the perfect pakora .. but it was awesome.. wen I sent clicks to my mother.. she was telling me that.. even she didn't know how to make pakora.. he he .. all credit goes to u.. wenever my family asks me to do or ask me whether I know how to do.. I just reply "padhus irukka bayam aen " .. wow.. that's the confidence u have given us with u r receipes... I m now fully confident that If I prepare anything with the measurements u advice.. then It ll be a perect treat to the taste buds.. keep up u r good work.. padhus .. I m the one who haven't come to kitchen until 2 yrs back .. that was the time I got married. God bless u and u r family..